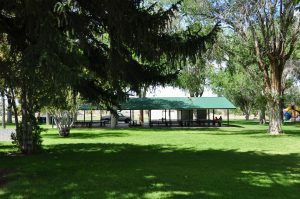 The Pavilion in the Levan Town Park can be rented for your next event. Keep all vehicles on the road or parking areas. Never park vehicles, trailers or RV's on the grass. No guns, bow and arrows, BB guns, slingshots or weapon of any kind without prior approval from Town Council. No fireworks of any kind without prior approval from Town Council. Do not use slides as waterslides. Please help us keep or park clean and beautiful so everyone can enjoy it. Rental of the Park is for the Pavilion and Parking spaces only. The rest of the Park is available for use by the public (Including small pavilion, playground and ball diamond). There are no electric or water hookups available for trailers at the park. In accordance with the Utah clean air-act, Levan Town Park is a TOBACCO and ALCOHOL FREE PLACE.